The AF1 & 2 were the first Emilio cigars that I tried. They are blended and manufactured in Esteli, Nicaragua by AJ Fernandez – hence the AF moniker. Both have a Nicaraguan filler blend and binder. The AF1 carries a spicy sweet San Andres wrapper, while the AF2 is wrapped with Ecuadoran Habano oscuro leaf, and also contains a bit of Pennsylvanian ligero for just a smidgen of added strength. Each line comes in four vitolas – robusto (5X50), toro (6X50), Torpedo (6X52), and BMF (6X58), and retail in the $6.60-7.80 range throughout the Florida market. I find more savory spice in the AF1, with a sweeter, toastier flavor pallette with the AF2. The AF2 is perhaps my favorite of all Emilio blends. Without fail, both lines provide a very well behaved burn and outstanding construction. 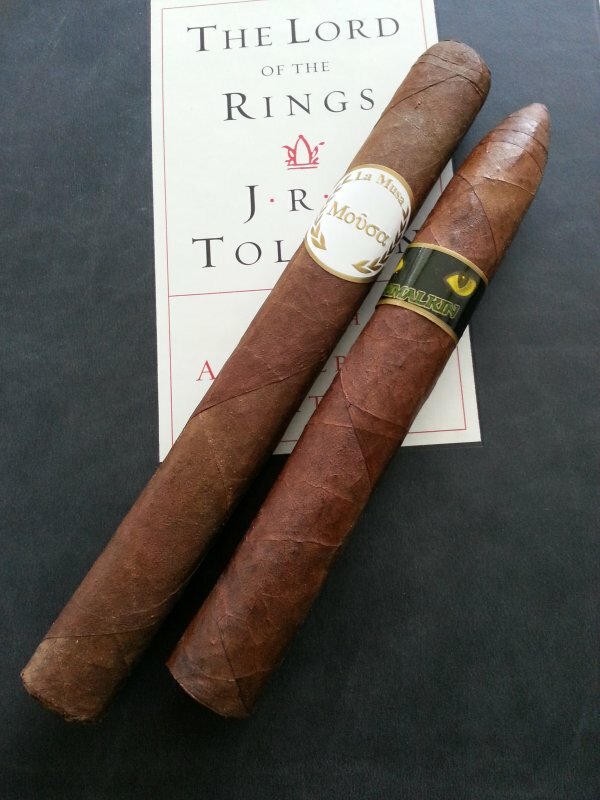 I naturally gravitate toward smaller cigars, and personally prefer the robusto. However, I would never turn my nose up at anything from either series. 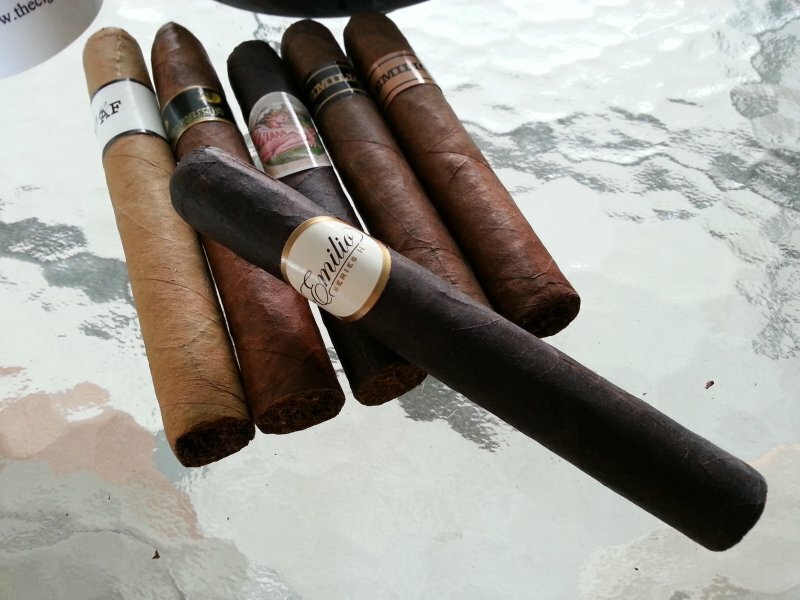 The AF2 in particular is one of those cigars that should be savored and enjoyed for every lit minute…there is quite a range of flavors presented throughout the experience; all quite pleasant. It is one of few cigars that I invariably smoke down to a tiny nub. I never worry about bitterness or harshness, and just sit back and enjoy the ride. Released in February 2011, the Grimalkin generated quite a buzz throughout the cigar world. Early in its life, the composition and manufacturer were the subject of a fair amount of speculation, and I won’t add much to that here, except to say that if memory serves I believe it was rolled by the Garcia family in Esteli, Nicaragua. It was rebranded earlier this year, and is now offered under the La Musa banner. Pictured at left is the La Musa melete box-pressed Churchill, a vitola only made available at CHATWEETUP back in August. At first light, I find a bit of spice – although subdued, never overpowering. This spice is tempered with a pleasing sweetness that makes it a very comfortable smoke. Overall a medium-bodied blend, cedar and cocoa abound in the early portions of the stick, with a strong sweetness developing deeper into the smoke. For full disclosure, this is the least familiar Emilio line for me, having only smoked the torpedo Grimalkin and aforementioned churchill in the La Musa. The La Musa is available in robusto, toro, torpedo, corona, and lancero, and retails for $7.80-9.00. Again, I have had no issue whatsoever with construction or burn. Another great cigar when you can find them. Emilio released the AF Suave over the Summer, the third collaboration with AJ Fernandez. Back at CHATWEETUP, I purchased a few Suave from Burns’ Tobacconist and had a seat by Nate McIntyre (Director of Sales for Emilio Cigars). I told him this would be the first Suave I had had a chance to smoke, and his first words were “that’s not your GrandDad’s Connecticut.” I told him “that’s good, because I’m not typically a Connecticut fan.” Turns out, he was right. A CT wrapper sometimes provides a bitterness to my palate that I don’t especially appreciate. Coupled with the milder flavor profile often blended to accompany the wrapper, it’s one I don’t commonly reach for. The Suave, however, is quite a different experience than what I expected. For one, the strength is notably more potent than my expectation allowed for. It’s still (in my opinion) the mildest blend in the Emilio Cigars portfolio, but nonetheless a notch bolder than I would have assumed. Throughout the cigar, I find the expected sweet notes of hay, bordering on a nuttiness that makes for a releaxing, fun smoke. Even with the added strength, the Suave makes for a fantastic start to the day when accompanied by a good cup of coffee. The line is available in robusto, toro, torpedo, corona, and churchill – and retails for $6.80-7.80 here in Florida. The Series H comes with either a Jamastran (Honduran) maduro wrapper or Sumatran, and each has a different binder and filler blend. 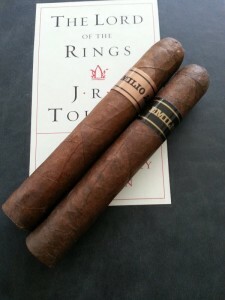 Per the Emilio Cigars website, the maduro wrapper “envelops a unique blend of Nicaraguan and Costa Rican tobaccos,” while the Sumatran contains a Honduran Connecticut binder and “is filled with a blend of Jamastran and Costa Rican tobaccos.” The maduro version is pictured left. This represents the first line blended by Gary himself, and was released earlier this year. Of all the Emilio Cigars product lines, this is the one I’ve had the most trouble locating on store shelves. I don’t believe the production is severely limited, it just has not yet reached the masses in my normal Florida stomping grounds. I know Tranquilo Cigars in Melbourne carries them. Of the two available wrappers, I would normally select the maduro when given the choice because of the earthy sweetness I find in it (Honduran tobacco often produces this for me). It provides a really nice prelight aroma at the foot – something I might not normally mention, but really stands out in this cigar. Throughout, I get a nice earthy sweetness that flirts with chocolate – although I would stop short of calling it an overtly chocolate character. The Sumatran comes across as a bit more spicy than the maduro, and overall I would consider it as having a distinct, coffee-like flavor. It provides just a hint of bitterness – but not unpleasant; the bitterness you would find in a bold, strongly brewed cup of coffee. I also occasionally pick up a savory almond or bitternut flavor that is nice as well. 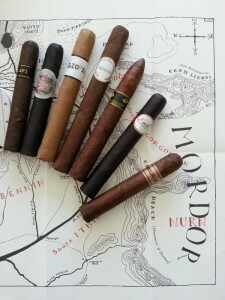 These, when you can find them, retail for about $6.80-7.40 per stick, and come in robusto, toro, and torpedo. Ah, the Draig. In the words of a certain Python-player….”Oh yes, it’s very nice-a.” With the AF2, the Draig truly stands head and shoulders above the crowd as my favorites of all the Emilio cigars….which is problematic. While the AF2 is fulltime, regular production, the Draig is a limited release. 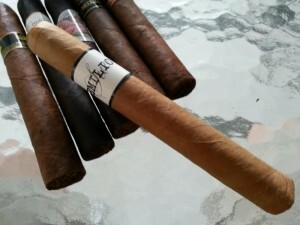 The 2012 edition, known as the Draig K, “utilizes a very rare batch of Colombian maduro wrapper,” and features Honduran and Nicaraguan filler leaf. This year’s total production consists of 400 ten-count boxes each of three sizes – the corona, robusto, and toro – and retails in the $9-11.00 range per stick. I managed to put away a few of these, although once word got out the became quite scarce in a hurry. I know of one retailer who still has a few on the shelf…but don’t ask; I’m not telling :). 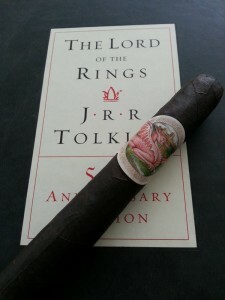 The Draig K is a fantastic cigar, lining up directly in my personal preferences for flavor in a smoke. I find the character of the cigar to be quite floral with a cocoa presence throughout. The depth of the sweetness seems to come in waves, ebbing from this bold, floral presence to the less sweet notes of dark chocolate. The only downside to enjoying a cigar this much is the knowledge that its marketplace presence is limited, and it will soon be a memory. So, I save the ones I do have for rare occasions and savor every last puff…. In addition to the ever-increasing offerings from Emilio Cigars, Gary has seen exponential growth this year as a distributor. He currently distributes a growing lineup of other makers as well, including 1502, Guayacan, Herederos de Robaina, and Rodrigo Cigars. 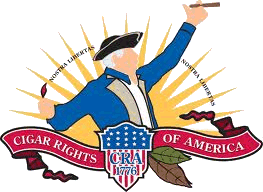 After having a couple of opportunities to spend some time chatting with him, I have to say he is absolutely one of the good guys within the cigar industry – very approachable, personable, and always ready with a kind word or bit of advice…and of course, flying nut kicks if the situation calls for it. You can give him a follow on Twitter or find more info from his website. While I have clear favorites amongst his cigar offerings, there are none that I wouldn’t recommend. His portfolio has exploded this year, and there are even more releases planned over the next 12-14 months as well. No matter your own taste in cigars, there’s bound to be something for you in the Emilio Cigar stable. Gary’s own stores still have plenty of Draig’s in stock.